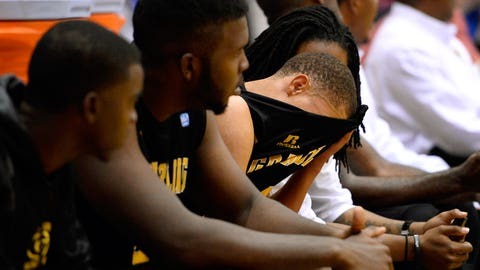 It's not easy on the floor or on the bench for players at Grambling State. Update (12:22 a.m. ET): Grambling State ended its 32-game losing streak Monday night, beating NAIA school Central Baptist (Arkansas) at home, 83-75. Cornell now owns the nation’s longest losing streak at 16. The last time Grambling State played a nonconference game at home was Nov. 19, 2011, against Oakland. The official attendance was 371, and Grambling lost by 30. That was the fourth game of a 4-24 season. Things have only gotten worse. "It weighs on my heart," Grambling senior Steven Danridge said. "I’m letting a lot of people down." In 2012-2013, the Tigers became the eighth Division I team to go winless in any season, and have now lost 32 games in a row. The most recent defeat — a 97-55 loss at Arizona State — came and went as little more than a transaction. Arizona State hands Grambling a check, and Grambling hands Arizona State a W.
"I’ve been through it for four years now, being an HBCU," Danridge said. "We have low funds, so you have to go out and play money games to get some kind of financial stability for your athletic department. We’ve got to have some kind of money to go to other sports to have scholarships." Within the environment of amateur athletics, it is uncomfortable to know about the cold calculations of these transactions, so they are rarely discussed in advance coverage or postgame press conferences. At most, the winning coach will offer a nod in the direction of it, an honest little allusion that nobody involved expected a competitive match. But if you ever ask the winners if they felt any sympathy for the overwhelmed mercenaries, the answer always is no and the implication is always the same: Better them than us. I’ve been through it for four years now, being an HBCU. We have low funds, so you have to go out and play money games to get some kind of financial stability for your athletic department. Everyone does this, even Grambling, which paid a small guarantee in order to host Central Baptist on Monday in Grambling, La. This game is Grambling’s best opportunity to win since the last time it actually did, which was against Alabama A&M in the last game of the 2011-12 season. The Tigers have lost every game since by an average of 27.5 points. The paycheck games have gone the worst, usually, but there was also a 77-38 loss to Jackson State, a 95-50 loss to Texas Southern, 82-43 to Southern, 93-45 to Southern Miss and 87-47 to Houston. You wonder how this could happen, and the answer is "somewhat easily, actually," which is the concise way of saying that Grambling is caught inside a terrible cyclone of NCAA sanctions that reduce a team’s ability to compete and institutional poverty that requires it to hit the road. As a way of holding its institutions accountable for the academic progress of their student-athletes, the NCAA created something called the Academic Progress Rate. The APR is a formula, and its explanation and intricacies are almost unfathomably boring, but the big idea is that it puts the screws to schools whose student-athletes are not making progress toward earning degrees. Coaching changes tend to have a devastating effect on a school’s APR score, because coaching changes usually result in transfers, and transfers are less likely to make progress toward degrees. Well, Grambling coach Joseph Price is the school’s third coach since 2009. On top of that, SWAC schools often take more chances on players with academic issues and, in some cases, lack the support staff available to athletes at higher-profile schools. The NCAA has recognized these challenges and made some exceptions, but if the newest APR rules, introduced in 2001, had been enforced without mercy, 18 of the 21 schools in the SWAC and MEAC would have been ineligible for postseason play. As it is, four of the 10 SWAC schools are ineligible for this season’s NCAA tournament. This includes Grambling, which is under sanctions that ban it from the NCAA tournament, reduce its scholarships from 12 to 10 and reduce its weekly practice hours from 20 to 15. On top of that, Price, who is in his second season, was hired late, which curtailed his ability to recruit, which meant last year’s team existed mainly because the only other alternative was to take the year off. "I didn’t get on until May," Price said. "By that time, there’s no players left." Grambling played last season with four scholarship players. It has 10 players on scholarship this season, but two of those are former walk-ons. And then, of course, there is the money, which Grambling desperately needs — just check its football program this season — and which the basketball team can easily generate by sacrificing itself to an Arizona State, a Marquette (114-71), a DePaul (96-58). Central Baptist coach Wes Sullivan understands what Price is going through, because he’s dealing with a lot of the same issues. He doesn’t have as long a losing streak — CBC’s streak is three, having beaten Ecclesia College Nov. 23 — but he is coaching the team on a one-year, interim basis, and it’s been all he can do just to compile a roster. Before this he was a volunteer women’s coach at a Division III school. He took the CBC job two weeks before school started. "We’re in the same boat," he said. "We played one home game in the fall. I don’t even know what our record is because some of them are listed as exhibitions. … It’s just so difficult to, night in and night out, show up and play as hard as you can and then lose by 40 or 50 or 30 or some numbers the kids just aren’t used to. There’s no character building. There’s not a single thing that is beneficial to those kids about playing (those games)." Like Grambling, the Mustangs take a lot of those "guarantee games." They’re 1-7, and lost to Southeast Missouri State by 52, to Williams Baptist by 41, Arkansas-Fort Smith by 55. The school they beat, Ecclesia College, has fewer than 200 undergraduate students. The last team Ecclesia beat was Rhema Bible Training College, which does not post the results of its games on its website. "We’re a pretty popular phone call for people trying to find games at the last minute," Sullivan said. For psychological reasons, Central Baptist has broken down the season into sections. In this section, there is a simple goal. "Let’s go find a win in this batch of games we’re not supposed to get," he said. "I’m sure (Price) does the same thing." "We broke the season up into three seasons," Price said. "Right now our plan is just getting ready to jell together." Grambling’s next three games are against Central Baptist, TCU and Lyon College, meaning the Tigers should win two of their next three. Soon SWAC play begins and, look, this is an entirely new Grambling roster. It returns just two players from last year’s winless team. Even at 0-for-32, there’s always the next one. "I feel like we can win the SWAC with this team," Danridge said. Hey, it pays to dream.